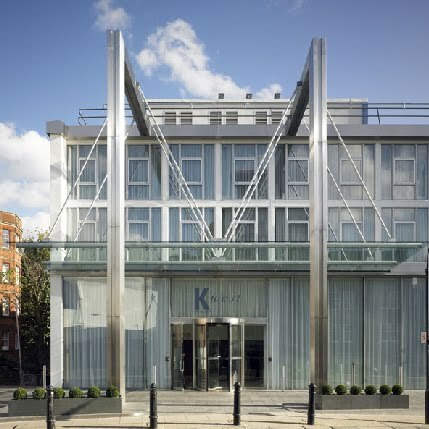 I recently spent a very relaxing late afternoon/evening at the K-Spa, loacted within the K-West Hotel, near Shepherds Bush. I was invited to go along and test out the facilities (it’s a hard life…) as it’s currently Spa Fortnight on lastminute.com (meaning lots of bargains like 241 to be had). In fact, I just checked and there is a 241 deal on spa days at K-Spa – a whole day of pampering for two for £165. So, my first impressions of the hotel were that it was a tad surreal. A super-modern looking, glam hotel in the middle of an area where it’s mostly residential streets. A little bizarre, but still – the hotel is very convenient for the Shepherds Bush tube, which is only a couple of minutes walk away, as is my spiritual home of Westfield shopping centre.The building is a former BBC office building, but has been transdormed into a super modern hotel. I was shown around to get a feel for the rooms and spa facilities before being left to my own devices to chill out in the spa. The spa itself is immaculate, sleek and very luxurious. Everything was taken care of – towels, robes, products, flip-flops… everything. All I needed to bring was my bikini. I worked my way around the steam room, sauna, snow room and relaxing pool. I even squeezed in a bit of a snooze on one of the lounge-booths. All very relaxing. I did skip the newest addition to the spa – the snow room – at -15 degrees, it wasn’t really my thing (I’m a wimp and hate being cold!). After a couple of hours in the spa, I returned to reception for my ultimate back relief treatment. This was 45mins of pure indulgence, including scrub, oil massage, hot stone massage, bubble mask (bizarre, but amazing) plus arm, leg, foot and hand rub. LUXURY. I felt thoroughly relaxed at the end of it all – which is really saying a lot as I had a pretty stressful day (long story, basically a bug flew in my eye, scratched it and caused a lot of red, swollen, gross-ness, general discomfort and pain – not that I am a drama queen or anything…). So, thank you to K-West for inviting me to visit the spa, it was a lovely end to a stressful day. Keep an eye on lastminute.com for the latest deals – make the most of spa fortnight! I was invited to visit the spa free of charge for review purposes. All opinions are honest and my own.